Maximum size: about 25 mm (Hoover, 2006). 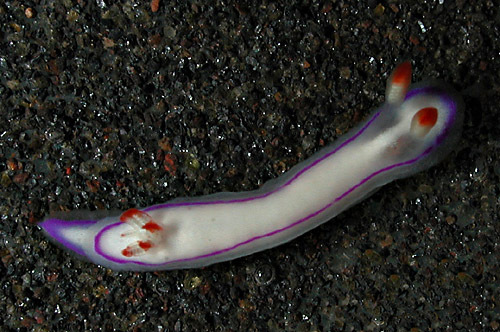 Identification: The body of this small, slender nudibranch is opaque white with a magenta line encircling the notum just inside the mantle margin. The rhinophore stalks are translucent, with the clubs orange-red on the anterior side and opaque white on the posterior side. The gills are opaque white with orange-red tips. In very young animals, the notum is translucent and has a herringbone pattern of embedded white spicules beginning between the rhinophores and ending at the gills. It may be distinguished from Thorunna kahuna by the lack of prominent opaque-white mantle glands around the posterior margin. It also has an opaque white (rather than translucent pink) notum when mature and a boundary between the orange and white pigment on the rhinophores that is angled rather than straight. Natural history: Thorunna daniellae is a moderately common diurnal species found on rocky bottoms. It occurs in moderately exposed to highly exposed locations from 5-27 m (16-90 ft) and vibrates its gills. It lays a pale peach to cream egg mass that hatches in four to six days in the laboratory. It probably feeds on a grayish sponge that is usually concealed in algal turf. Distribution: Big Island, Maui, Oahu, Kauai, Niihau, Midway and Kure: widely distributed in the Indo-Pacific. Taxonomic notes: This species was listed as Hypselodoris daniellae in Kay, 1979, Kay & Young, 1969 and Kay & Schoenberg-Dole, 1991. It was named for malacologist Danielle Fellows. It's referred to as "Danielle's Thorunna" in Hoover, 1998 and as "Danielle's nudibranch" in Hoover, 2006. It was first reported in Hawaii from Ala Moana, Oahu in March, 1962 (Kay & Young, 1969). Photo: CP: 8 mm: near McGregor Point, Maui; Oct. 9, 2003.